Scott Vocca and Vicki Gish who run the Irish music session at the Claddagh Cottage Irish Pub, (4308 Curry Ford Rd, Orlando, FL 32806) bought the pub, recently, only to have the property sold out from under them a few months later. Businesses in the small strip mall were abandoned and several were boarded up. It looks like the whole area will be bulldozed for new development. Inside the pub however the warm inviting music continued. 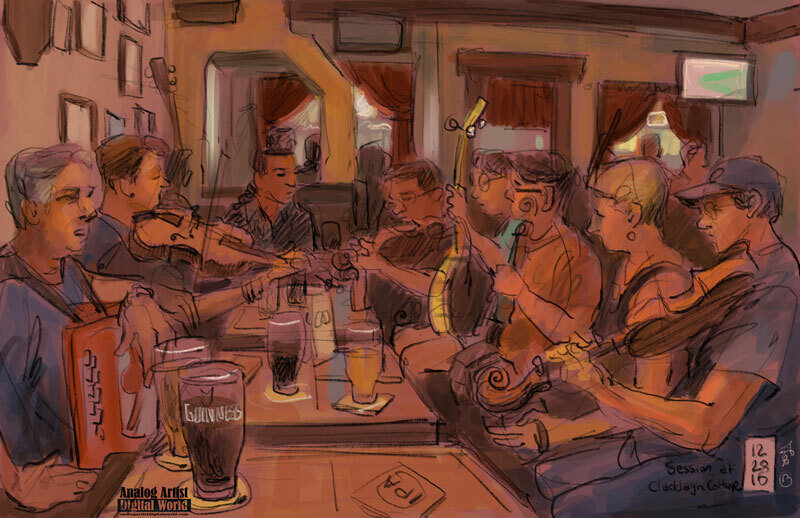 Every other Wednesday these Irish music sessions liven up the pub. This was the last Wednesday session of the year before the pub closes its doors for good. On this evening there were several soulful solos sung. 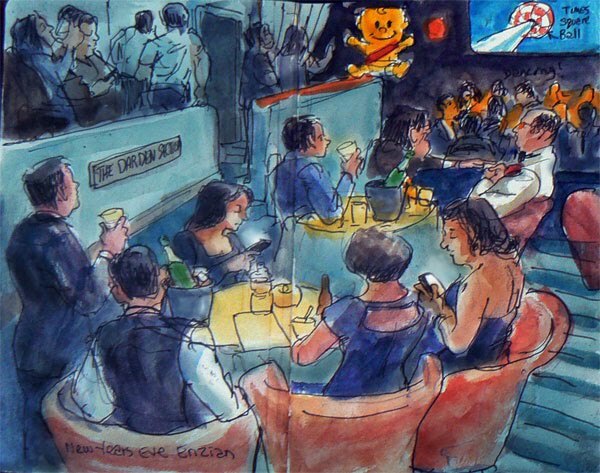 When I started the sketch, a young woman with jet black hair and a young round face was singing as everyone in the bar stopped to listen. I wish I had caught her in the sketch. A tenor sang a solo in Gaelic and his voice also caused pints of Guinness to pause on their way to lips. The accordion player to my left wanted photos anytime he knew a tune and joined in. A sweet Irish woman to my right was glad to oblige although she couldn't figure out the buttons on his cell phone camera. There will be one final blow out Irish party where you can have your last pint at the Claddagh Cottage and listen to The Bronx Boys ring in the new year with traditional Irish and American music. Alan Murray will be joined by Isaac Alderson on uilleann pipes and vocals andAlasdair White on fiddle. This party will be the last day at the original Claddagh Cottage so get out and help them drink everything up! The party starts at 6pm and goes until 3am. The Claddagh Cottage will be demolished in early 2017 to make way for a Walgreens. Scott and Vicki, who purchased the pub business in early 2016 are building a new Claddagh Cottage a mile west at 2421 Curry Ford Rd near Bumby Ave. Stay tuned for updates as to when the new location will be open. Meanwhile the temporary home for the Irish session for the first few months of 2017 will be at the sister pub, The Harp and Celt, (25 S Magnolia Ave, Orlando, FL 32801). It will be held on the north side of the bar (the Harp side) at the regular time and dates. The music starts around 6pm or 7pm and continues until the wee hours of the morning. Weekend Top 6 Picks for New Year's Eve and New Year's Day. 6pm to 2am Free. New Year's Eve with the Bronx Boys. Claddagh Cottage Irish Pub 4308 Curry Ford Rd, Orlando, Florida 32806. Come out and have your last pint at the Claddagh Cottage and listen to The Bronx Boys ring in the new year with traditional Irish and Americana music. Alan Murray will be joined by the other 1/3 of the band, Isaac Alderson on uilleann pipes and vocals as well as Alasdair White on fiddle and Anna Colliton on bodhran. This party will be the last day the original Claddagh Cottage so come out and help us drink everything up! 9:30pm to 2am General Admission Tickets: $49 All Inclusive Tickets: $89 DRIP's New Year's Eve 2017. 8747 International Dr Suite 102 (Behind Denny's and Senor Frogs), Orlando, Florida. Celebrate 2017 on New Year's Eve in Orlando rock 'n' roll VIP style complete with glamour stations, champagne cocktails topped with rock candy, fabulous people, interactive adult painting, gorgeous performers, raw theatrical show, dancers performing in paint, flying water, colored sand, live rock band, a LIVE performance leading up until midnight, after party with dancing and SO. MUCH. GLITTER. INTERACTIVE ADULT COLORING: Try out a new larger version of adult coloring with a table top sized design and paint! GLAMOUR STATION: Be pampered at the Glamour Station by getting glitter nails, lips or even a sparkling temporary tattoo! GRUNGE VS. GLAM WALL: Add the things you want to leave behind in 2016 on the Grunge Wall and then write your dreams for 2017 on the Glam Wall. Later that night, you'll be able to destroy the Grunge Wall with paint balloons! PHOTO BOOTH: Snap all the selfies and group shots that you want in the photo booth area that is filled with sparkling textures and props! Enjoy a full theatrical love story with dancers performing in paint, flying water, and sand to a LIVE rock band. It's a standing room experience with performances happening in front of you, behind you and in between you! DRIP's live rock band plays the soundtrack to colors that fly with abandon creating unique works of art on your special edition NYE shirt! Enjoy drinks by the color! DRIP's Color Bar has Red, Blue, Orange and Yellow beer, cocktails, shots, wine and non alcoholic beverages for sale. This New Year's Eve, a special champagne bar will be added featuring champagne cocktails topped with rock candy of all colors! -Special Edition DRIP NYE T-Shirt for you to get colorful that night! -Table Sized Adult Coloring with Paint! -All you can drink for 3.5 hours. 10am to 2pm Free. Comedy Open Mic. Austin's Coffee, 929 W Fairbanks Ave, Winter Park, FL. Free comedy show! Come out & laugh, or give it a try yourself. 2pm to 4pm Free. Yoga. Lake Eola Park, 195 N Rosalind Ave, Orlando, FL.Every week. 4:30pm to 6:30pm Free. Market2Park. Shady Park Hannibal Square New England and Pennsylvania Aye. Winter Park. December 12th marked six months since the horrific shooting that took 49 lives and ruined counties others at Pulse Nightclub. Pulse owner Barbara Poma opened the chain link fence surrounding the club to the first time, at 2am for family of victims and then later that evening for the general public to mourn. The angels gathered, holding candles at Pulse along the Orange Avenue length of fence. Purple neon glowed above the entrance to Pulse. Media and passers by shot photos. 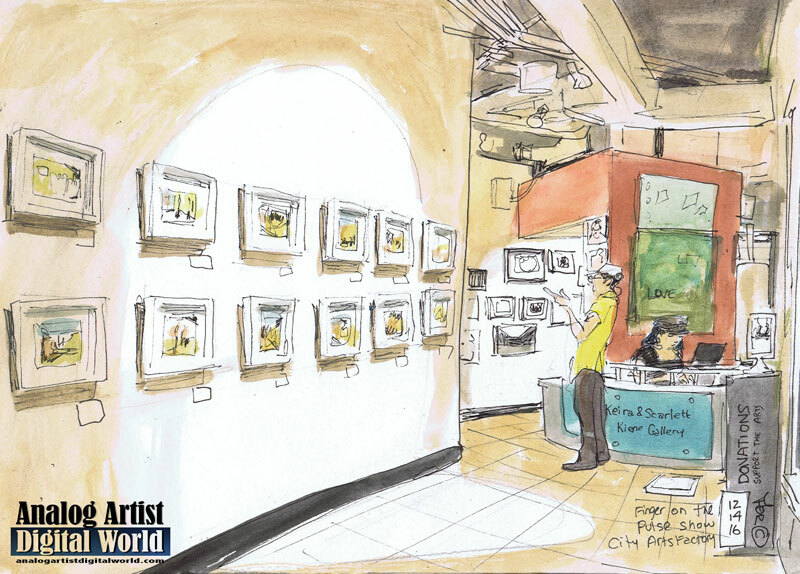 One reporter from Channel 13 News, John Davis, was curious about my digital sketch and he interviewed me the next day as I hung 18 sketches at City Arts Factory that document Orlando's attempts to heal since the mass shooting. The city will never be the same. At the entrance there was prayer and then song. One song was Wind Beneath My Wings, which seemed perfect for the angels in attendance. The Orlando Science Center (777 E Princeton St, Orlando, FL 32803) hosts Otronicon each year. Otronicon is a celebration of interactive technology that takes place each January at the Orlando Science Center. It offers a glimpse into the future and a demonstration of how interactive technology will impact how we work, learn and play. At Otronicon, guests walk on the cutting edge through state of the art video games, digital media, digital art, and workshops – not to mention military and medical simulators typically not available to the public. 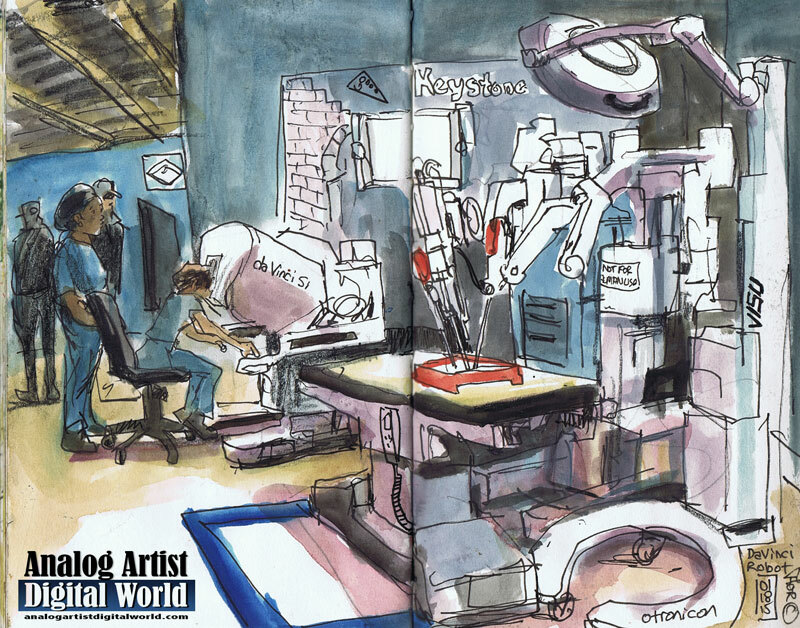 The da Vinci Surgical System is a robotic surgical system made by the American company Intuitive Surgical. Approved by the Food and Drug Administration (FDA) in 2000, it is designed to facilitate complex surgery using a minimally invasive approach, and is controlled by a surgeon from a console. The system is commonly used for prostatectomies, and increasingly for cardiac valve repair and gynecologic surgical procedures like hysterectomies. According to the manufacturer, the da Vinci System is called "da Vinci" in part because Leonardo da Vinci's "study of human anatomy eventually led to the design of the first known robot in history." If you have a passion for technology, simulators, and video games in general, mark your calendars for the most interactive technology expo in Central Florida – Otronicon. This event takes the world of video games and simulation, and transforms them into in-depth immersive experiences. There will also be classes in video game creation, as well as exclusive peeks at simulators created by experts in the field. This is the one weekend when the Orlando Science Center leaves its doors open for extended evening hours, so be sure to plan on experiencing all of the interactive fun at Otronicon. Otronicon will run from January 13th to 16th, 2017. 10:00 a.m. – 5:00 p.m. (All Ages) Tickets are available online. On Christmas Day Christine and her family host a White Elephant Party for Christmas orphans.I'm a bit of an orphan this year since I'm separated and not even sure where I will be living in 2017. Christine hosts a potluck dinner with more food than you can imagine and crystal clear Greek 99 proof drinks that will make your toes curl. Everyone brings a funny or practical white elephant gift and then people picked their gift when a number is pulled from a hat. There is an advantage to having your number pulled later in the proceedings. When you open your gift in front of everyone, you have a choice. You can keep your gift, or exchange your gift with some on who has a be the gift than yours. I was called up rather late in the process, and picked a large flat package. I ripped the paper, ribbons and bow off. It turned out to be one of those tacky paintings with celebrities sitting around a table playing poker. The only way it could have been worse is if it had been dogs playing poker. I figured I was stuck with it. However, a young college aged boy must have figured it would look good in his man cave dorm room and he stole it from me. I don't even remember what I got in exchange. with all the downsizing I have been doing moving place to place lately, I doubt I still have it. 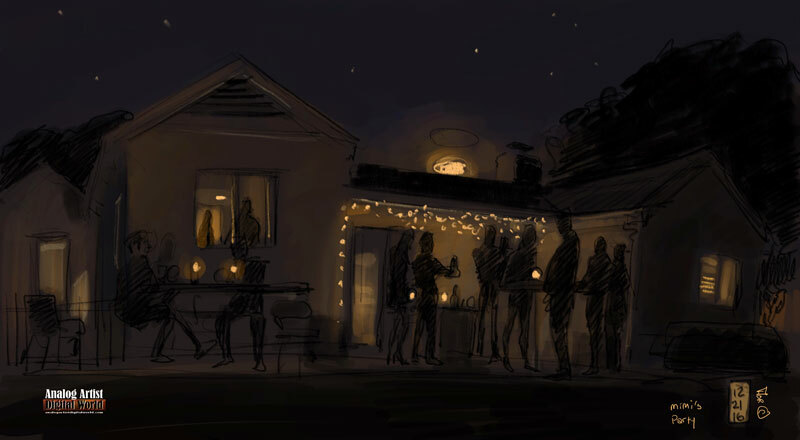 This party is a great way to catch up with old friends an make new ones. The large Greek family makes us all feel at home. I went to Without A Paddle Cafe, (1000 Miami Springs Dr, Longwood, FL 32779) for the second annual Boat Parade on the Wekiva River. Parking on site was packed, so I drove a block away to Publix and parked there. There was snow being blown from the rooftop of the cafe. It melted on my sleeve just like real snow but then we re no flakes. They were more like lumps and I suspect they were soap suds. I made sure my computer brief case was closed up so the suds couldn't damage my digital sketchpad. All the wooden dock side chairs were taken so I found an empty spot between camping chairs and picnic blankets. The first board spread down the river with Christmas lights ablaze, and the driver held up an air horn and blasted the crowd. Every one stood up, so I finished the sketch while standing. Small boats followed in succession up the river. One had a large round nose on the bow and antlers. It was clearly Rudolph. An other board had Christmas light lined butterfly wings which animated when a pulley and rope was pulled. The winner for the evening was a small boat decorated to look like a steam train engine. The most popular decorating ate rice was tree branches, which when wrapped in lights look like a deer antlers. On the opposite shore lights outlined Christmas Tree shapes. Spotlights illuminated the dark woods. At the corner of the cafe stood a totem that looked to me like a tall sea creature with large black eyes. On closer inspection, I discovered that it was actually lashed together canoes. The black eyes were spot lights. I preferred to imagine it being an exotic squid shaped creature. 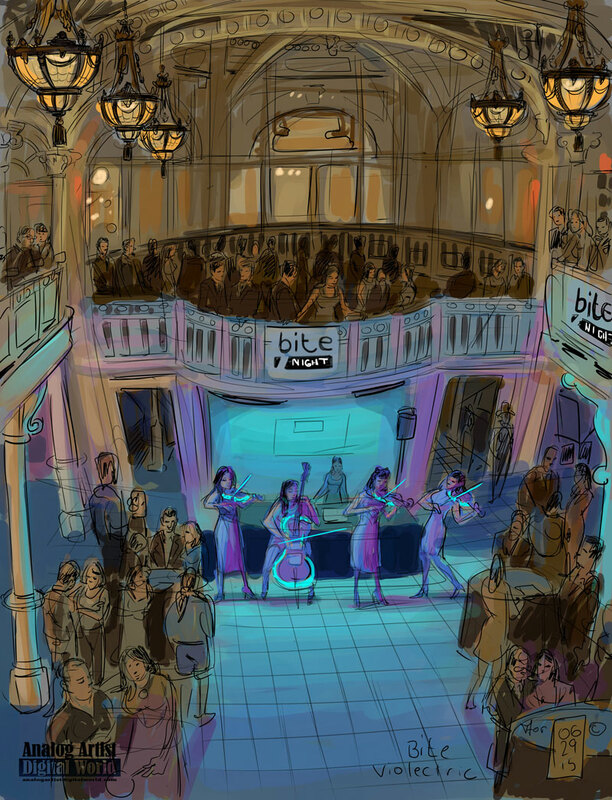 Inside the cafe, I noticed Beth Black performing on violin. There was a large area covered in snow, or more likely crushed ice. And kids were having a snowball fight with the slushy mess. I picked some up just to feel the cold. Stilt walking angels had white Christmas lights to outline their wings. Mr. and Mrs. Claus were on a boat with lame Christmas lights that blinked of mire often than they were on. That didn't dampen the crowds enthusiasm as they shouted and waved to him. Weekend Top 6 Picks for Christmas Eve and Christmas Day. 9:30am to 4 pm Christmas Eve Open House. 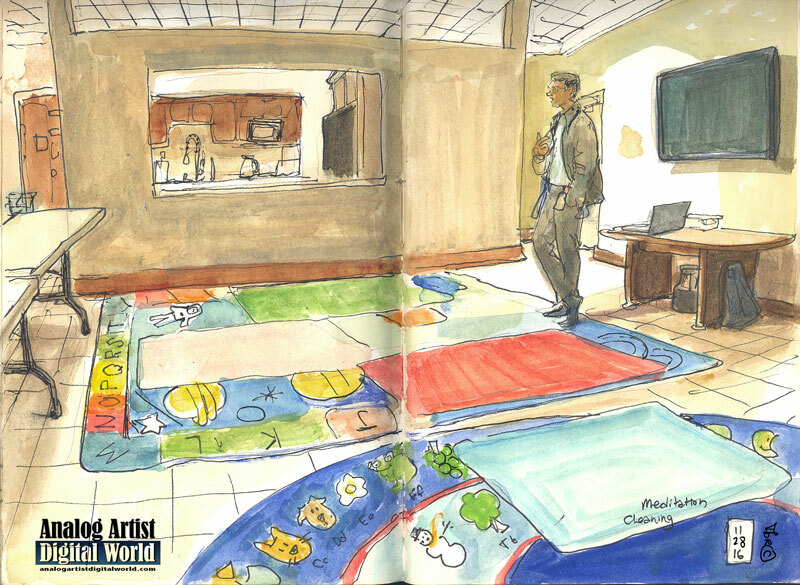 The Charles Hosmer Morse Museum of American Art, 445 N Park Ave, Winter Park, FL 32789. 6pm, 7pm, 8pm and 9pm Snow Falling Nightly in Celebration. Celebration Town Center. 6pm and continues hourly until closing. Holiday Light Show at Light Up UCF. CFE Arena. 5:30 pm to 7:30pm Chanukah on the Park. Central Park, Winter Park FL. 5:36 pm Sunset St. Augustine Nights of Lights. Take a day trip (about 90 minutes to 2 hours from Orlando) to St. Augustine to enjoy their Nights of Lights display. St. Augustine’s popular holiday season city-wide event – the famed Nights of Lights celebration – will glow with more than three million brilliant white lights again this year attracting hundreds of thousands of visitors to the oldest city in the Nation. Nights of Lights runs November 22, 2014, through January 31, 2015, in St. Augustine, Fla. 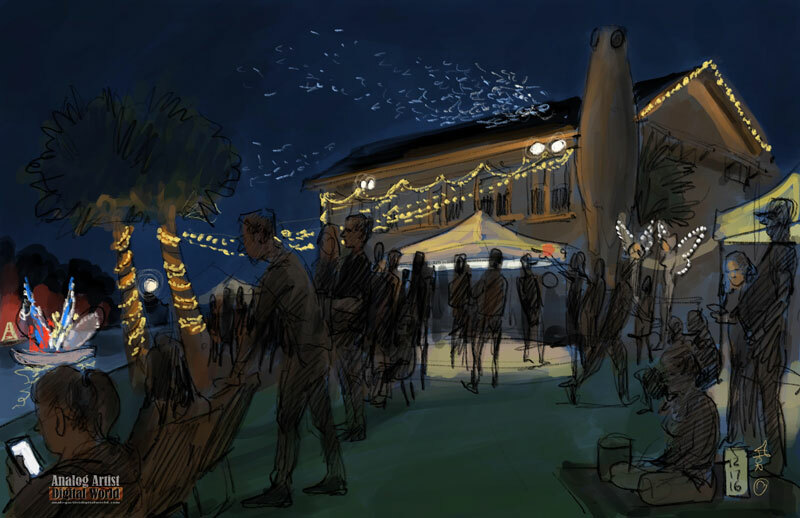 The festival starts with a countdown November 22, 6:30 p.m. in the Plaza de la Constitucion when the lights are officially lit. Holiday music and the lighting of the city’s Christmas tree add to the splendor of the lighting of one of the world’s greatest holiday light displays. Many historic landmarks and locations are beautifully illuminated during Nights of Lights. The waters of Matanzas bay glow from the nightly reflections of lights strewn along the bay walk and displayed on the Bridge of Lions. The Plaza de la Constitucion shines from the top of trees and throughout the famous center of St. Augustine’s historic district. The 125-year-old Hotel Ponce de Leon, now the campus of Flagler College, is outlined in lights. And the Lightner Museum, once a resort hotel also built by Flagler, is lit so brilliantly it is a favorite among visitors. Nights of Lights is inspired by the tradition of marking the holiday season with a single white candle burning in a window at each home during the nearly 250 years when St. Augustine served as the capital of Spanish La Florida. Today, Nights of Lights continues that tradition in a grand style reflecting the city’s 449 years of history. Nights of Lights continues to garner accolades. In 2014, Rachel Ray magazine named St. Augustine one of the Nation’s “Twinkliest Towns.” National Geographic declared St. Augustine one of the Top 10 Places in the World to view holiday lights in 2012 and 2013. The American Bus Association named Nights of Lights a Top 100 Event in North America.. The Ice Factory is an NHL-size skating and hockey rink located in the heart of Florida. Staffed by experienced, professional skating instructors and certified coaches, the Ice Factory features a 750 Seat Stadium and two Ice Surfaces. On December 11th, the Maitland, Presbyterian Church (341 N Orlando Ave, Maitland, FL 32751) presented A Russian Christmas. Russia is well known for producing talented composers like Tchaikovsky and Prokofiev. 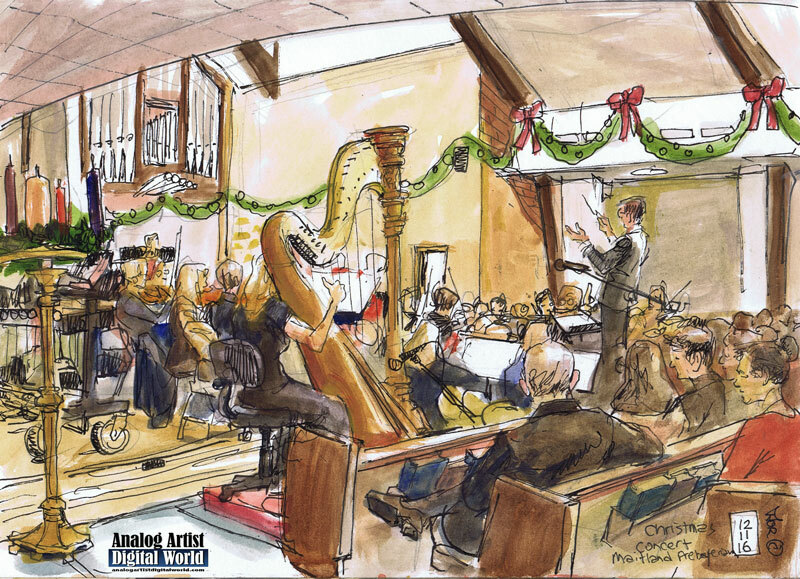 This concert presented sounds of the holiday season with a Russian flair. 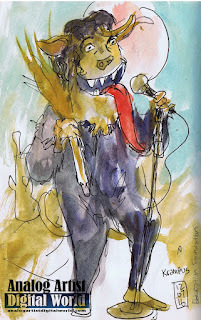 June Flowers, who organizes music a presentations around Central Florida, asked me to come and sketch the performance. June introduced me to Elizabeth St. Hilaire who is a visual artist and also a violin player. I made sure to get Elizabeth's pinch hair in the sketch. The Artistic Director and Conductor was Eric W. Mendez. Most arrangements were purely instrumental, but Cantique de Noel featured soprano Laura Bertshinger. Her performance elicited a standing oration. The Emcees for the night were Sent in a columnist Scott Maxwell, and Margaret Patten. Scott mentioned an article he had just written about 101 of the things that make Central Florida unique. I had just read that article and pulled it out of the paper because it contained so many sketch opportunities. That article listen the Maitland Symphony Orchestra as one of the unique 101 gems. The concert was free, but of course donations were encouraged. This concert was certainly a way to warm up to the Christmas season. I slipped away during A Christmas Festival by Leroy Anderson. I wanted to avoid the crush of the crowd when the concert ended. 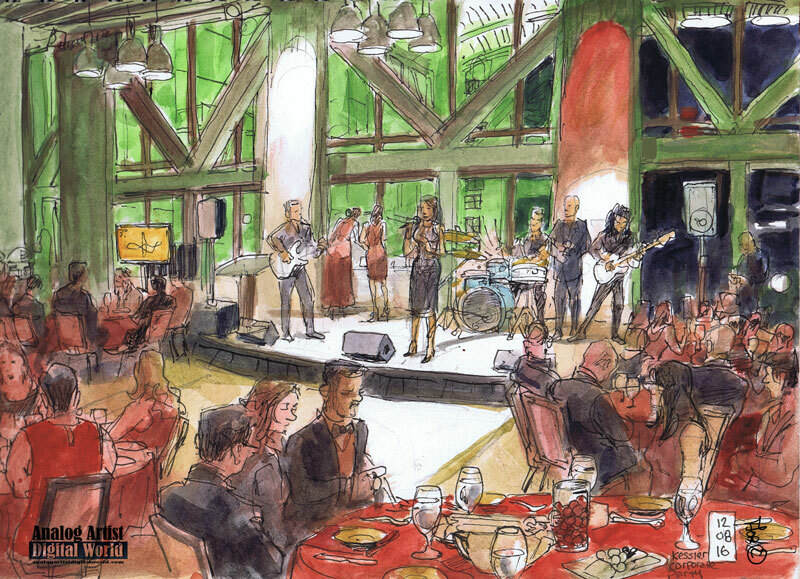 I was commissioned to sketch at the Kessler Corporate Christmas Party held in the Devos room in the Dr. Phillips Center for the Performing Arts (445 S Magnolia Ave, Orlando, FL 32801). C'Nergy was the local band offering cover tunes for the evening. I arrived early entering the venue through the loading docks. My art supplies made it through security with no problem. The Devos room is on the third floor above the Center's entry area. Glass walls surround the room on three sides offering an incredible view of the new plaza outside the Center. In June thousands gathered in that plaza to morn the loss of 49 of our own to gun violence. Candles flicked above the crowd. One glass wall slid open and I had to walk over to look. The green expanse of a lawn was now empty and silent. The sky was a deep ultramarine blue with flickering stars. A woman next to me said, "Don't jump." I laughed and joked that with my luck, I'd probably only break a leg. With that theater reference under my belt, I returned to my sketch. Several Kessler Collection employees stopped to ask questions as I worked, it turns out I was on the program... "Experience the works of illustrator and journalist Thomas Thorspecken. 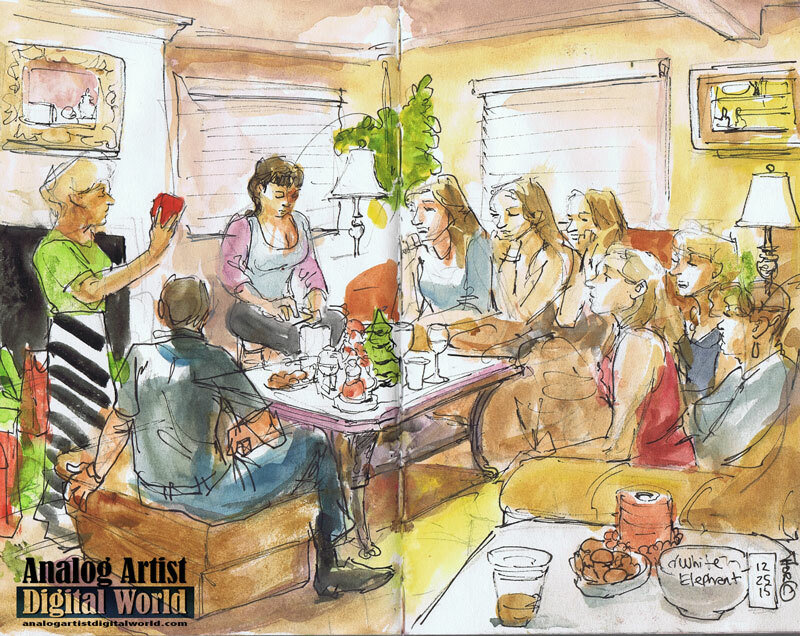 He's a talented local artist who sketches stories of Central Florida's community daily in his popular blog." I was surprised that the MC announced me as well and I waved as people turned to look at me. After the cocktail reception, everyone was invited to find a table so the party could get started. Mr Kessler was at the front table, but his table wasn't full. Most of the other tables were full. The MC insisted that people move in closer to the stage. "We are going to have to do a training exercise if people don't move closer, Mr. Kessler doesn't bite." Finally several couples moved to the front table. An executive in bright red shoes introduced a party game he devised. He wanted each table to come up with a fun reason why it is a unique experience to work for the Kessler Collection. Two of the tables on stage left got their submissions in right away. He got back up to the mic later in the evening to scold the other tables who hadn't yet participated. After endless raffle prizes, he pointed out that there were only five raffle tickets unpicked and so he advised that "If your ticket wasn't picked, you shouldn't play the Lotto." Mr. Kessler got on stage. The big announcement was that the Plant Riverside development was underway in Savannah Georgia. The one time I visited Savannah, I stayed in a Kessler historic home right on one of the many public parks in a city. With gorgeous art, and gorgeous historic architecture, it was a wonderful place to stay. The Plant River side construction will take 24 months at a cost of 217 million dollars. Apparently there were many hurdles along the way. One Kessler employee said that he attributed his grey hair to the endless negotiating. Patience and perseverance eventually made the dream a reality. The 1912 Georgia power plant located on the west end of River Street in the National Historic Landmark District is being revitalized into an ultra-chic hotel delivering an electrifying Hostess City experience. There was an awards ceremony for staff that went above and beyond the call of duty. The one person I met at the event, Leile Ahlstrand, won the highest honor. She welcomed me warmly and instantly made me feel at home when I entered the Devos room, so I understand why she was honored that night. My sketch was complete. As the band started playing again, I made my way to the front table to show Mr Kessler the final product. My timing was a bit off since I had to shout over the music. He seemed to like the sketch and I explained the I would be writing an article. Then I found Leile and let her know that I was finished. We chatted for a bit. She was glowing as if she had just won an Oscar. None of the recipients had taken time at the mic to thank everyone who made the award possible. There was probably time for a second sketch, but my legs were tired from standing. I also wanted to get home to have a bite to eat. On the walk back home I passed artists set up on the sidewalks of Thornton Park selling their art. Christmas lights illuminated white tents. It was quite festive, another sketch opportunity, but it was getting late and they were starting I break down. Besides I was over dressed. I returned to the Orlando Science Center, (777 East Princeton Street Orlando Fl 32803) to sketch the continuing construction on the Climb Time area of the New Kids Town. I was amazed at how much the structure had progressed in just one week. I was committed to doing one sketch a week, but felt that a sketch a day would have been needed to get a full time lapse effect of the constructions evolution. The hard hat was still needed since there was overhead wall work and construction still going on. The construction foreman kept an eye on me to be sure I was safe and not in the way. Mostly the structure was complete with just a few tweaks needed to be sure it was study and ready for the endless stress of children at play. Each green pillar was very heavy and required three workman to maneuver it into place. All that remained now was a few protective screens that needed to be secured. 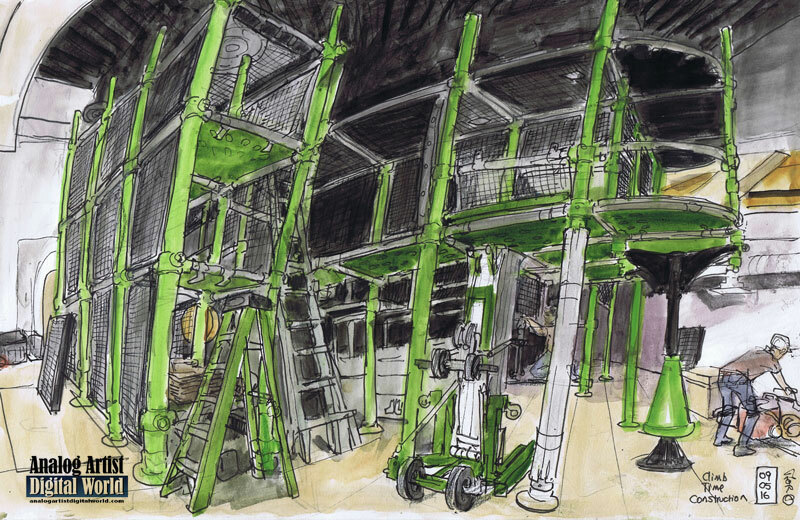 This series of sketches was commissioned as possible gifts for people who donated money for this 5 million dollar expansion to the museum. For me it was fun to see how the construction. Site changed week to week. Workers got used to my presence and they liked to glance over my shoulder to see if they had been captured. When they recognized a coworker they would rib him, saying that the reason he made it into the sketch was because he was standing around and doing nothing. Every worker however was constantly in motion. Progress was insanely fast. exhibition is up from December 15, 2016 to January 13, 2017 Artist Opening Reception: Third Thursday December 15, 2015 6-9pm Thomas Thorspecken (Thor) presents "Finger on the Pulse", Orlando's Artistic Expression. After the Pulse tragedy, Thor went to every vigil and fundraiser possible to documents Orlando's attempts to heal. 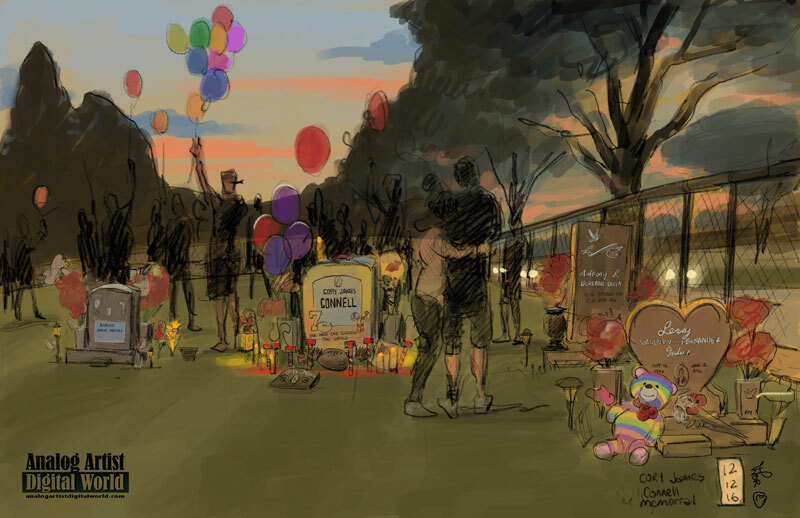 This project continues as he sketches family and friends of victims along with survivors, employees and first responders. For some the healing will take a lifetime. 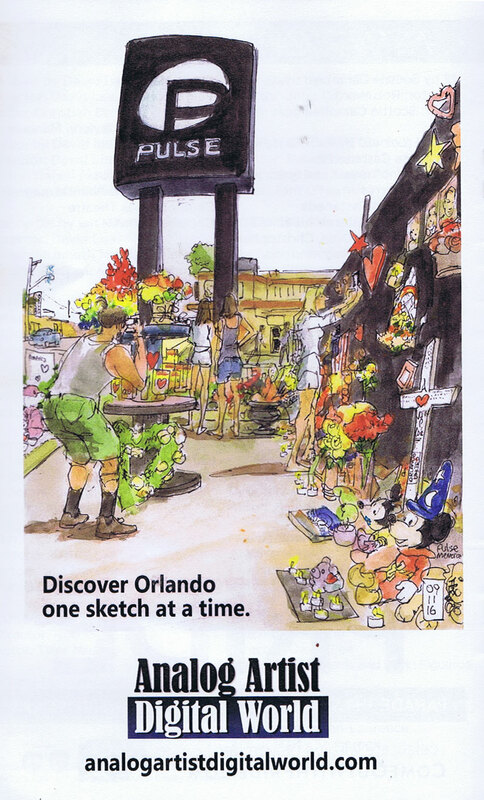 Thor has been documenting arts and culture in Orlando for the past 10 years by doing a sketch a day and writing articles that share the city's history. The project began as a New Years resolution, and has become a lifestyle. 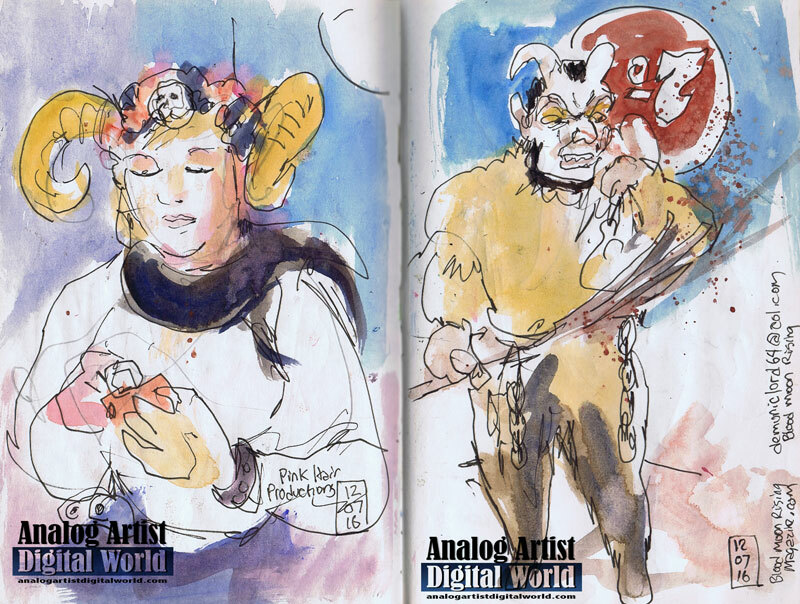 The show features 19 prints of the sketches done in the weeks and months following the Pulse tragedy. I transported all the framed pieces to City Arts Factory in granny cart. All the pieces were protected using a bed sheet and some towels. It was such a luxury to be able to walk from my Thornton Park apartment downtown. Ive gotten spoiled since I moved from the dingy Winter Park apartment I was renovating these past 6 months. Anyway, each print has a QR code on the label that leads to a full write up about each event sketched. Orlando is still healing. For some the healing will take a lifetime. A News 13 TV reporter, John Davis, shot footage as I hung the show, and then He interviewed me about all the Pulse themed sketches I have been doing. The story went live that night, but since I don't have a TV, I didn't see it. I contacted a Pulse survivor about an interview at the History Center, and she said that at the moment she read my request, my name was mentioned on Channel 13 News. That coverage helped me land the interview and sketch. I'm heading over for the opening soon. Be sure to stop out to City Arts Factory before January 13th to see the show and possibly pick up some of my art for your art collection. On Saturday December 17th from 7pm to 9pm, the Russian Ballet School is presenting a free performance of The Nutcracker at the Walt Disney Amphitheater (99 N/ Rosalind Avenue Orlando Fl 328801). This will be the 17th Annual presentation. There will be food trucks parks on Rosalind, if you would like to grab a bit before the dancing begins. This sketch done in 2015 was never published, but the scene is very much the same. Holiday traditions and decorations get reused year to year. I made no effort to get close to the stage for the sketch. Instead my focus was on the picnickers who set up their spreads in the grass. With so many people in attendance, I never actually saw even a hint of a dancer. The music is memorable however. In 2015 it was actually quite chilly requiring jackets and hats. I'm thinking this year will be quite a bit warmer. It must have been in the s as I walked around downtown today. A blimp circled overhead and the larger metal hooped Christmas tree was all ablaze. I've seem Nutcracker so often that I knew what must be happening on stage although I couldn't see over the crowd. Occasionally cell phone would illuminate faces in the crowd. This is a wonderful annual Christmas tradition and it can be appreciated from a distance or right up close. It is a great way to get in the holiday spirit. It can be a magical night. 1pm to 2pm Free. 21 Annual Merry Tuba Christmas. Central Park, W Morse Blvd, Winter Park, FL 32789. Tubas, Christmas, enough said. 5pm to 10pm Free. 2nd Annual Boat Parade. Without A Paddle Cafe, 1000 Miami Springs Dr, Longwood, FL 32779. Come visit Wekiva’s Winter Wonderland and join us for our 2nd annual boat parade on the Wekiva River. All interested participants must register by December 16th at 7p. Details Below. Arrive early to enjoy food from our Without a Paddle Cafe, grab a drink and get a great seat on the dock for the parade. Please bring your own chairs or blankets. Carpooling and UBER are strongly encouraged as parking will be limited. Show proof of your UBER receipt and get $3 off your bar tab. 7pm to 10pm Free. Art and Education Winter Gala. Henao Contemporary Center 5601 Edgewater Dr, Orlando, Florida 32810. The PreJax Foundation presents an evening at the Henao Contemporary Center to promote local art and; the education of exceptional students affected by multiple sclerosis. The PreJax Foundation is a 501 (c)(3) organization (which means donations are tax deductible). This non-profit exists solely to provide college tuition assistance in the form of $1,000 scholarships. These go to exceptional students who either have a parent with MS or have themselves been diagnosed. Noon to 3pm Free. Peter and the Wolf. Central Park, W Morse Blvd, Winter Park, FL 32789. In addition to some of our best local Orlando talent playing Lennon's music from The Beatles to solo, we will feature Orlando artists, vendors and food trucks all coming together to celebrate John Lennon's music, film, art and message. This year's event will be a first of it's kind as we are broadcasting a live audio video simulcast with coordinated Lennon Tributes in Nashville, Los Angeles and Anchorage. 3pm to 5pm Free. EXHIBITION TOUR with Guest Curator Arthur Blumenthal, Ph.D. Cornell Fine Arts Museum 1000 Holt Ave, Winter Park, Florida 32789. "In the Light of Naples: The Art of Francesco de Mura" is the first-ever exhibition of the art of Francesco de Mura (1696–1782), arguably the greatest painter of the Golden Age of Naples. The leader in his day of the Neapolitan School and the favorite of the reigning Bourbon King Charles VII, De Mura was the chief painter of decorative cycles to emerge from the studio of Francesco Solimena (1657-1747), the celebrated Baroque artist. De Mura’s refined and elegant compositions, with their exquisite light and airy colors, heralded the rococo in Naples, and his later style led to Neo-Classicism. The exhibition—which will travel to the Chazen Museum at the University of Wisconsin-Madison and the Loeb Art Center at Vassar College—features more than 40 works by De Mura from museums and private collections in the United States, as well as Italy and the United Kingdom. The Cornell Fine Arts Museum’s painting by De Mura “The Visitation,” ca. 1752 was the impetus for this show, which was curated by Dr. Arthur Blumenthal, Director Emeritus of the Cornell. The exhibition is accompanied by a catalogue published by the museum and D. Giles Ltd., available in the museum’s gift shop. Krampusnacht needs to become a holiday tradition. Krampus is a horned, anthropomorphic folklore figure described as "half-goat, half-demon", who, during the Christmas season, punishes children who have misbehaved, in contrast with Saint Nicholas, who rewards the well-behaved with gifts. Krampus is one of the Companions of Saint Nicholas in regions including Austria, Bavaria, Croatia, Czech Republic, Hungary, Slovenia and Northern Italy. The origin of the figure is unclear; some folklorists and anthropologists have postulated a pre-Christian origin for the figure. Presented by Pink Hair Productions and Thomas M. Bunting Projects, Krampusnacht was brought to Orlando at the Hammered Lamb (1235 N Orange Ave, Orlando, Florida 32804). My monthly ODD event (Orlando Drink and Draw) so I figured it could be a fun night of sketching demons. I was right. The best demon come out very late at night. By that time, I was spent having finished four sketches. 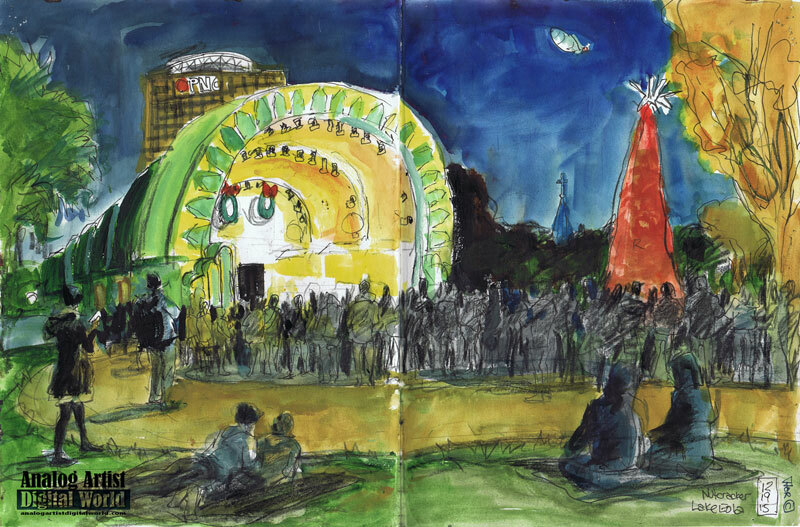 My primary sketch was of the main stage. The goal was to sketch Santa and the angry elves. They did a sound check and then disappeared for several hour to get changed. I never did see them perform. Brendan O'Connor was dressed as a Kampus, and he agreed to pose for a brief five minute sketch for the group. Brendan and Denna also walked the room applying temporary Kranpus tattoos to any patrons who wanted them. They affixed a demonic Krampus tattoo on my bald head as I sketched. It looked pretty good. They also applied a tattoo to the inner cleavage of a buxom woman's breasts. December 12, 2016 at 2:02am, Barbara Poma, the owner of the Pulse nightclub opened the gate to the fence that surrounds the club. It was exactly six months since the horrific mass shooting that killed 49 Orlando citizens. Friends and family of victims were invited inside for a private memorial candlelight service. A Pulse employee handed out rainbow ribbons to everyone in line. There was a small Christmas Tree outside the had ornaments for each of the 49 victims. As family and friends entered the gate, they had to empty their pockets and then go through a metal detector search. I sat on a stone bench right next to the entry door. In this exact spot I once comforted a friend who had too much to drink about nine years ago. Cut out stars and candles were arranged on the pavement inside the perimeter in a pulse shaped pattern. Couples hugged each other and everyone stood facing the building. A woman I didn't know hugged me and said she couldn't wait to see the sketch. She returned to her girlfriend in the crowd. A purple neon circle illuminated the spot above the entry. We were told not to go near the door since it was alarmed. I returned outside to join the line of TV news cameras. Cory James Connell's parents Tara and James Connell gave me a hug and a handshake. Tara said she was doing fine until they got to the club. She looked across the street with trepidation and then they walked across and entered the gate. 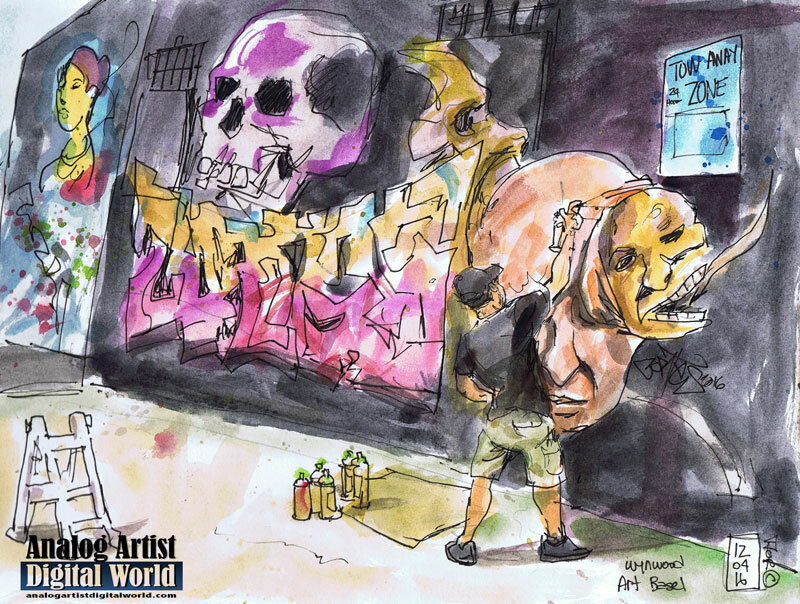 As I sketched I could hear crying from behind the art decorated fence. Someone was wailing, bereft. My heart broke. Afterward Tara told me that the six month memorial had been done right. Some memorial items were left inside and a bright rainbow sign was left for Cory. It was all so sad. I gave Tara a hug. She invited me to Woodlawn Cemetery that evening where her son was buried. Three other victims of the Pulse shooting were buried right beside him. A couple was buried to his right and the third to his left. At dusk they were having a service and would release Japanese floating lanterns in his honor. Tara gave directions to the grave site but there were so many twists and turns in the directions that I knew I was going to be lost. She confessed that she gets turned around when she goes. They went to their SUV, but James returned and gave me abbreviated directions. They both waved as they drove away. I wasn't alone. I love that family. "When a wave of love takes over a human being... such an exaltation takes him that he knows he has put his finger on the pulse of the great secret and the great answer." Orlando Krampusnacht was presented by Pink Hair Productions and Thomas M. Bunting Projects. He's half-goat, half-demon and all holiday cheer. He has horns and a long tongue he is covered in fur. He caries a switch which he uses to spank children who have been bad. This demonic holiday demon keeps children in line much more effectively than Santa. It was night of not-so-traditional holiday fun honoring Krampus! I decided to host ODD (Orlando Drink and Draw) at the Hammered Lamb (1235 N Orange Ave, Orlando, Florida 32804) on the same evening as Krampusnacht. About six artists stopped out to sketch the festivities. I wandered inside to enjoy the air conditioning, and discovered this incredible collection of Deviant Dollz. These adorable, bloody, bruised and scared dolls all had personality. Many dolls had horns just like Krampus himself. The exotic sales mistress had on a billowing black skirt with a tight corset. Prices ranged from $20 and up. These bloody creations are sure to grab attention as the~f hang in Christmas stockings, or from a rope. Several dolls were sold while I did the sketch. I felt I had to work fast, before they were all gone. Krampus himself inspected the dolls with a knowing approval. Plans to go to Art Basel on Saturday were Shanghaied when I went to a gallery in New Smyrna Beach. 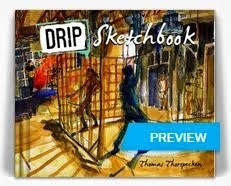 I couldn't sketch at this opening, so there isn't much to report. I kept my hands in my pockets except when sipping a Coke or eating pretzels. Occasionally shrimp circulated around the room on a tray. The show consisted of small paintings competitively priced for the holidays. I made the three-and-a-half hour drive down to Miami on Sunday instead. After parking in the Wynwood District I only had to walk one block before I saw a graffiti artist at work. This NYC artist was named Cortez. I couldn't make out what the letters were in the tag, but now after the fact, I'm thinking it might be his name. I got lost sketching the tag, so don't expect to read it in my sketch. It became an abstraction of bright colors, valves and shapes. The artist's girlfriend videotaped me as I sketched, and I asked the artist to sign my sketch when I was done. Art tourists kept taking photos of the wall in progress. For some people, the only way to experience art is to photograph it. I explored the Wynwood Walls and several galleries before heading over to the convention center, which is at the heart of Art Basel. Tickets to get in are like $45. I got there at the end of the day so paying for a few hours of browsing seemed like a waste. Instead I went to Ink, which consisted of galleries specializing in limited edition artists prints. Flying Horse Editions from UCF here in Orlando was on site. Each gallery had a quaint motel room surrounding a courtyard with a long central fountain. Since I am searching for a rental apartment, I desperately wanted to convert one of these small units into a studio. I went to a public park near the convention center where sculptures we scattered in the grass. Long- legged camels walked above a shimmering mirage reflection. Jesus had open avocados on his head, shoulders and forearms. Perhaps he as actually the patron saint of avocados. A black hula hoop was plopped on top of a pile of road tar, and the crowning glory was a pile of six-foot-high brightly colored pebbles that looked like the cheery painted rocks you might find in a fish tank. I stopped at Maxine's on Collins Avenue for a bite to eat. It isn't as good as the Maxine's in Orlando, but I went in h honor. Afterwards I followed the long line of red taillights that inched towards I-95 to drive north into the night. <10am 4pm="" b="" free.="" to="">Elite Animation Academy Open House. 8933 Conroy Windermere Rd, Orlando, FL 32835. Learn what Elite Animation Academy has to offer at this free open house. Elite Animation Academy is an art and Animation program designed for students interested in the Art of Animation. Elite Animation is proud to be a “Partners in Education” with Dr. Phillips High School, Olympia High School, Chain of Lakes Middle School, Foundation Academy, Trinity Preparatory School, Windermere Preparatory, Windy Ridge Elementary, Providence Foundation, Holy Family Catholic School, Saint Margaret Mary Catholic School and The Orlando Science Center. We have also partnered with Orange County Library System and the Autism Society of Greater Orlando (ASGO). We offer classes for children as well as Adults. Our classes are during the week and on Saturdays, with convenient afternoon and evening hours. 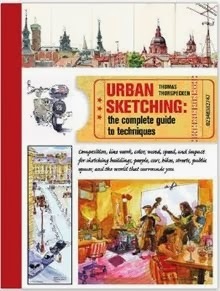 We focus on basic to intermediate levels with an emphasis on history, theory, and sketch along with Animation exercises each week after the topic. Our classes are small to provide you with a more personal connection with the teachers and get the most out of the lessons. Combined, our instructors have over 50 years experience in the industry working for Walt Disney Feature Animation, Marvel and other major movie studios' Developing young minds through the art of animation. 7pm Free. The Annual “Violectric Holiday Show”. Walt Disney Amphitheatre at Lake Eola Park, 99 N Rosalind Avenue, Orlando, Florida 32801. Rock Into The Holiday Season With Strings Sensation Violectric At The Annual “Violectric Holiday Show” Saturday, December 10 At Lake Eola Park In Downtown Orlando. Festivities Include VIP Pre-Party with Concert Behind-the-Scenes Presented by Old Forester and End of Prohibition After-Party With 1920’s Theme Costume Contest. Bring a Non-Perishable Food Item to Benefit Second Harvest Food Bank of Central Florida. 11am to 4pm Free. A Florida Highwaymen. See a Florida Highwayman painter at work. Orange County Regional History Center, East Central Boulevard, Orlando, FL. Noon to 3pm Free. Music at the Casa. Casa Feliz Historic Home Museum, 656 N Park Ave, Winter Park, FL 32789. Chris Belt, classical and contemporary guitar recital. After a radio interview, Joshua Vickery invited me to a dress rehearsal for The Stories of Christmas, at Central Florida Community Arts (250 SW Ivanhoe Blvd, Orlando, Florida 32804). 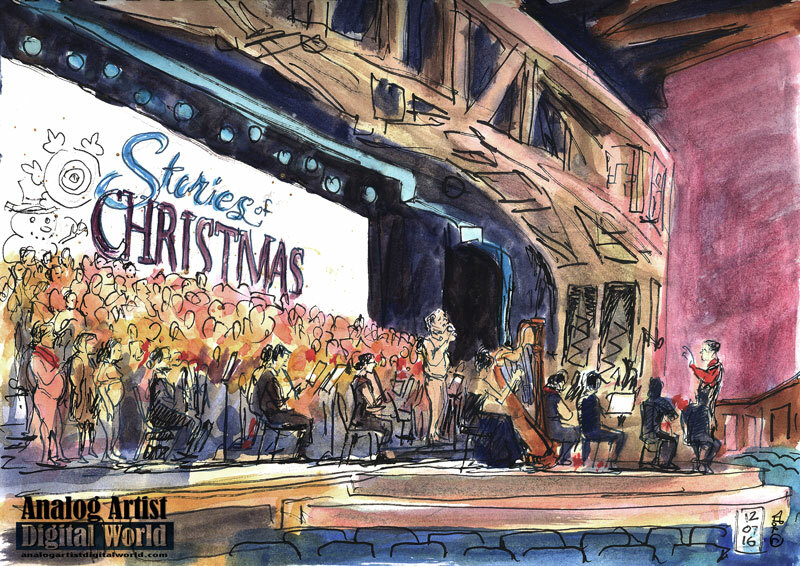 This holiday season, the 300 voice CFCArts Community Choir and members of the CFCArts Symphony Orchestra will perform their rendition of The Stories of Christmas. This year, the show will share family traditions, childhood memories, personal stories and much more through their favorite Christmas songs, as well as the incorporation of “Noel: The Carols of Christmas”, the retelling of the Christmas story through traditional Christmas hymns. Don’t miss this fantastic holiday production as only CFCArts can present. The Stories of Christmas will be held on Thursday, December 8th and Friday, December 9th at 7:30pm at Northland Church, (530 Dog Track Rd, Longwood FL, 32750). They are offering the convenience of assigned seating for this event! That’s right, you will be able to CHOOSE YOUR SEATS when you order your tickets. All seats in the auditorium will be assigned and will not be first come, first served. So buy your tickets now! Tickets are $10 each for advance sale ($15 at the door), Priority Seating tickets are $25 each, and tickets for Premium seating (which also includes a CFCArts Cookbook and Autographed Poster) are $50 each. Please note that tickets will NOT be available for walk up purchase at Northland at any time prior to the night of the show. 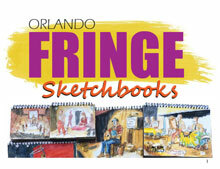 Tickets may be purchased online or by calling the CFCArts Box Office at 407-937-1800 x 710. Balcony seating is not handicapped accessible. For handicapped accessible seating, please call the CFCArts Box Office at 407-937-1800 x 710. Children ages 3 and under will be admitted for free. For those parents wishing for their 3 and under child to have his/her own seat, a free ticket will be available for reservation. Doors will open at approximately 7 p.m. Nature’s Table Cafe will be open at 5:30pm both evenings – come early and join us for dinner! I went to the Maitland Public Library (501 S. Maitland Ave., Maitland, FL) to "learn simple techniques that improve wellness of being." This Heartfulness Meditation happens every second and fourth Monday of every month, 6-8 p.m. I have attended group meditations before which consisted of 45 minutes of silent meditation, followed by a group discussion. I focused on the blankets on the floor thinking people would be sitting there as they meditated. 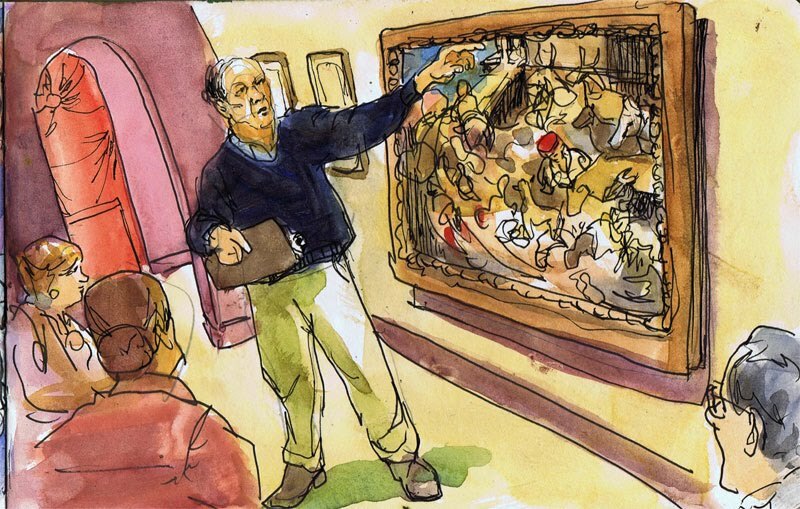 I was wrong: they sat classroom-style in rows of tables and chairs outside the sketch's composition. Only one person was in the room when I first entered. She had bright blue hair and confided that this was her first time meditating here. She had tried YouTube meditation videos and was afraid that the PC hooked up to the TV meant more of the same. The mediator for the session was a young Indian fellow whose name I never caught. For most of November I had to spar with a friend who I feared would be a delinquent client. My head was spinning, wondering what I could have done differently to preserve the friendship. The damage was done. My instructor seemed to sense this and he began by talking about someone who is obsessed with a fight. He had a nervous laugh that reminded me of a nephew of mine. With thoughts of the fight in mind, a person is already on guard, prepared for another fight. He offered us a guided cleaning. He used the metaphor of a dirty home. Sometimes cleaning just moves the dirt around. He equated a meditated cleaning to be like opening all the windows and doors to air out the space. The weather is finally cool enough to allow for that. My mind definitely needs to be aired out. The goal of his meditation session was to clear the heart space. He wanted us to imagine a source of light within which has no luminosity or radiance. Light is the most subtle thing to meditate on. When we imagine a light without illumination, it puts the mind on the edge of an inner dimension where we don't deal with thoughts but build heartfulness based on silence. He dimmed the lights to the room and everyone closed their eyes. I, of course, sketched, searching for the light in the dark room. Halfway into the sketch I realized everyone had taken their shoes off. Darn it, I couldn't even get that unspoken cue right. The brush sounded insanely loud on the page, so I slowed down my painting to try and stay silent. I doubt I succeeded. After the cleaning, we proceeded to a silent meditation which lasted perhaps half an hour. The goal was to stop chasing impressions and thoughts. To live life calmly. Our thoughts derive their power from our attention. Thoughts are like a river or clouds in the sky: when we feel them coming, then we have to let them go. Will power must be used to remove impressions. The will needs to be precise and firm. There were four others seated on folding chairs in the room. One left early and the woman with the blue hair left during silent meditation. Heather confided afterwards that meditation cultivated negative feelings in her mind. Her results were the opposite of what was hoped for. He let her know that this session had been short, and with regular daily practice she could achieve the heartfulness that would allow a life of being balanced and poised. With the sketch complete I lowered my head and relaxed. A minute later the session was over. I'm hoping that sketching gives the heartfulness he was talking about. My thoughts were limited to lighter, darker, larger, smaller. My inner dialogue about conflict had no room to grow. My heart stopped pounding in my ears. A truce meant a hope for peace. 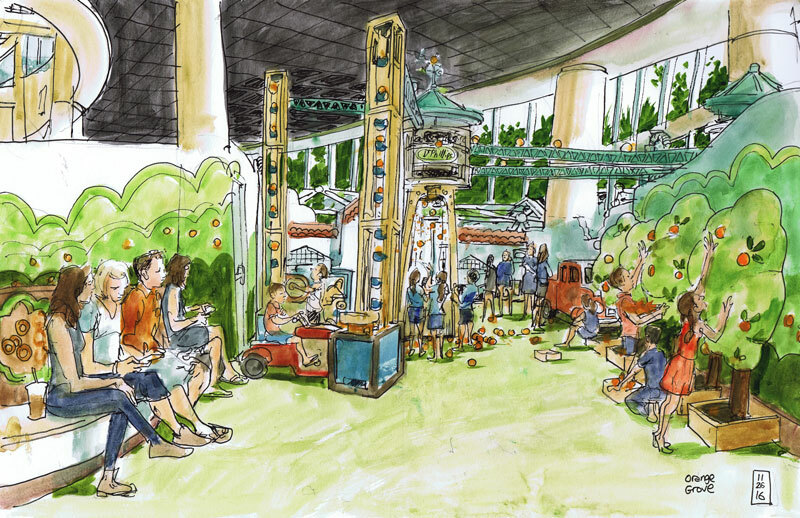 Each day I sketched at the Orlando Science Center's new Kids Zone construction site, I was issued a hard hat at the front admissions desk. 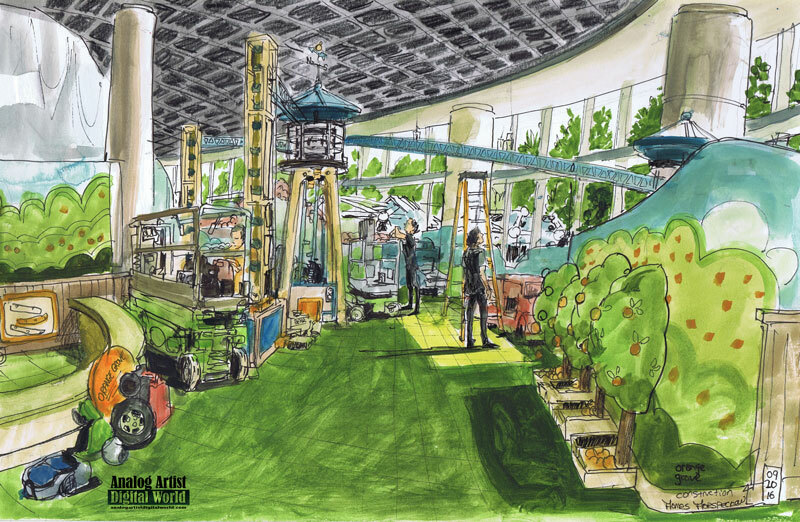 The day I stopped in to sketch the Orange Grove, it looked close to being complete. The construction foreman let me know that the hard hat wasn't needed since there was no overhead work being done. Large plastic sheets still isolated the construction site so museum goers couldn't see the progress. Only one young construction worker was doing minor work in the grove. He stood in a window of light, and inspected the elevated rails that would late transport oranges around the room. The oranges were orange balls and there were a few green balls as well. The bulbous plastic trees were ripe with fruit. Balls would automatically feed into openings in the trees waiting to be picked. A ladder was needed to get up high and check that the ramps were secure. I went back to the grove several days ago when it was filled with children. This quiet scene suddenly became a scene of chaos. Kids were running everywhere, picking fruit and getting it to market. 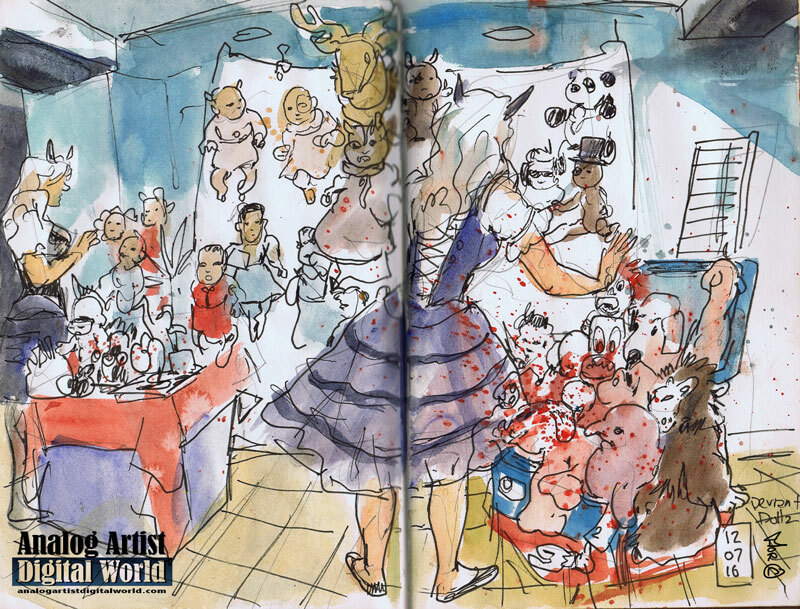 One little girl ran right into me, knocking my sketchbook to the floor. She was in a rush to get a box of balls to the market. If you have children, trust me, the will love the new Kids Zone. "Angel Action Wings For Orlando" Find New Home at The GLBT Community Center Of Central Florida. 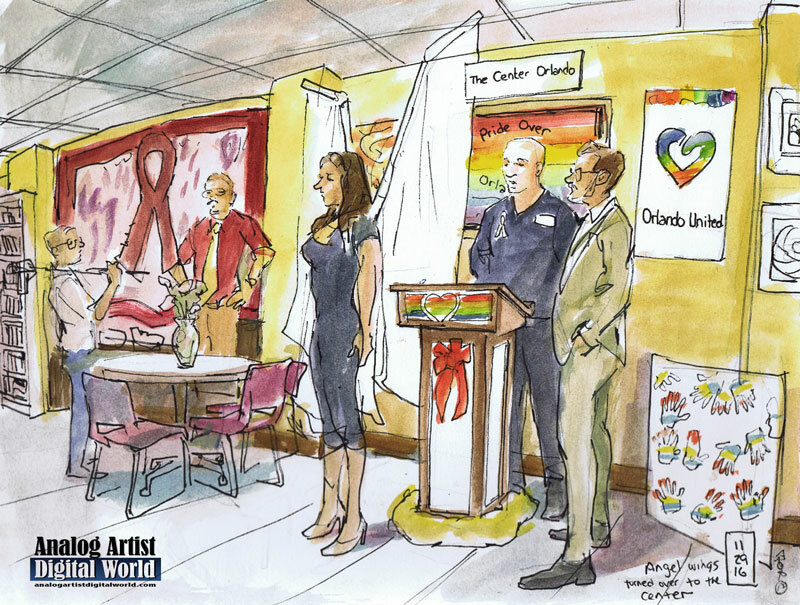 Orlando Shakespeare Theater (The Shakes) in Partnership with UCF permanently relocated the “Angel Action Wings for Orlando” to The GLBT Community Center of Central Florida (The Center). 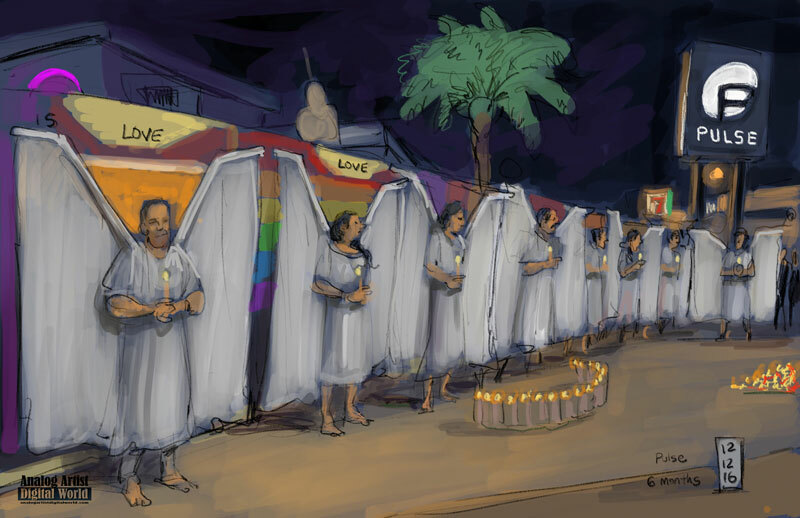 The “Angel Action Wings for Orlando” were originally constructed by volunteers from the community to shield mourners from anti-gay protesters during the funerals of Pulse massacre victims. They have since been used at the "Beautiful Together" benefit concert held at the Dr. Phillips Center and other local and national community events, including the recent Orlando “Come Out with Pride Parade” on Saturday, November 12, 2016. Due to the demanding performance schedule of Orlando Shakes, The Center has graciously agreed to assume responsibility of the “Angel Wings.” With this transition, the Center will manage the future use of the “Angel Wings.” All funds raised to support the care of the “Angel Wings” have been passed along to the Center as well. In addition to the 49 sets of “Angel Wings” provided to the Center, two sets of “Angel Wings” were also donated to the Orange County Regional History Center today for a new community display. Dangerous Theatre (115 W. 1st St., Sanford, Florida 32771) has just moved to Sanford. At a find dress rehearsal for The Perfect Gift, Winnie Wenglewick explained that she had been moving all day So the rehearsal promised to be a big one. Written and Directed by Winnie Wenglewick, the show features the talents of Winnie Wenglewick, Thomas C. Taffinder and Larry Stallings. This is the first show in the new Sanford Theater space. Blue tape on the floor showed how the cavernous space would be divided into two theaters each seating about 50 people. For now the place look like an abandoned warehouse which suits the theme of the production. Blue tarps stretched between metal pillars served as the dressing room. The play opens with a homeless man playfully sparring with an imaginary character. He is caught in a headlock when Stacia (Winnie Wenglewick) walks into the scene. They meet for lunch often on this park bench. She admires and accepts his quirky behavior. He is excited about the approaching Christmas Holidays but she is jaded, despising the religious hypocrisy and commercialism of the season. They both have fond memories from their childhoods but only he keeps that sense of wonder alive. He invites her to have a holiday feast with him and a buddy under a bridge. In the second act, the PVC supported black curtain is removed to open the space for a table covered in a tacky Christmas table cloth. A Christmas tree made from a series of hangers is suspended from a coat rack. The sumptuous feast consists of exotic holiday fair, like Doritos, chocolate covered pretzels and spam. Both men explain why they live off the grid. One lost his wife and then was put in a retirement home by his daughter. He escaped and prefers life on the streets to the stagnant home. His wife, whom he often speaks to, watches over him. when Stacia said, "Oh, you have an imaginary friend too." He responds, "She's not imaginary." The invisible friends are guardian angels. She comes to realize that sometimes all you have to do is listen with your heart. Stacia has to leave the banquet to give a present to her daughter. She approaches a small headstone and places a small doll up against it. In a flashback she recalls a holiday argument with her daughter who wanted an expensive doll for Christmas. Since it isn't in her budget she tries to convince her daughter that the present isn't what is most important. Unswayed , the daughter shouts "I hate you!' and runs off into traffic. what follows is an incredible monologue about loss and sorrow. After the show, Winnie explained that she has lost many dear friends in 2016. Kim Stalling who played a part in this production last year died. She listed other friends lost an then Pulse. She taped photos to the back of the headstone to remind her of the pain and sorrow felt this year. There might not be room to tape 49 portraits, but they were in her heart. She looked completely emotionally spent after the performance. 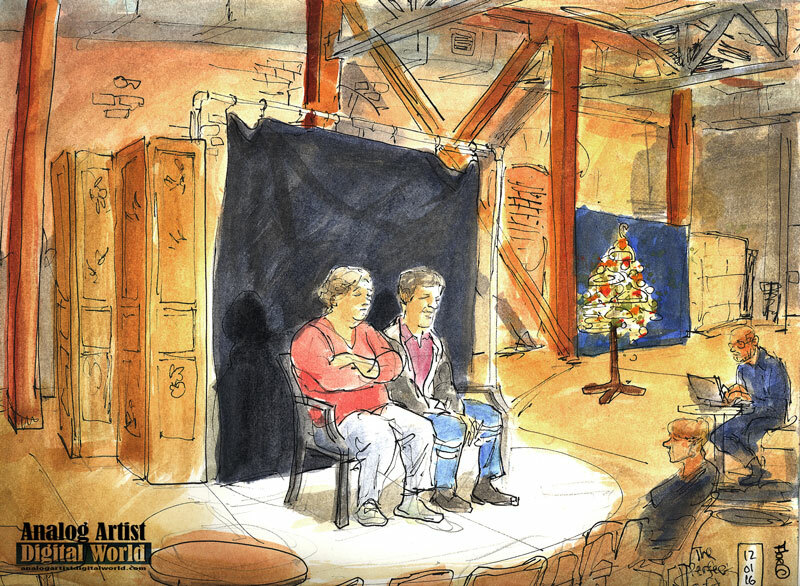 1960's animated holiday classic tunes filled the empty warehouse. $5.00 discount for students, seniors, military and anyone wearing a Fringe Button from any year. The ticket price includes holiday refreshments and treats. Thursday, December 8th @ 8pm "Alive After 5"
Every 2nd Thursday is Sanford's monthly Alive After 5 event from 5pm to 8pm just a block from the theatre on 1st Street. 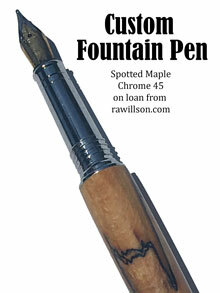 Be alive after 5 then come see The Perfect Gift. Donations collected at the end of the show. Please note: Seating for this show will be very limited, less than 40 seats per show. It is strongly recommended that you purchase tickets online or make a reservation by calling the Box Office at 407-358-6677. 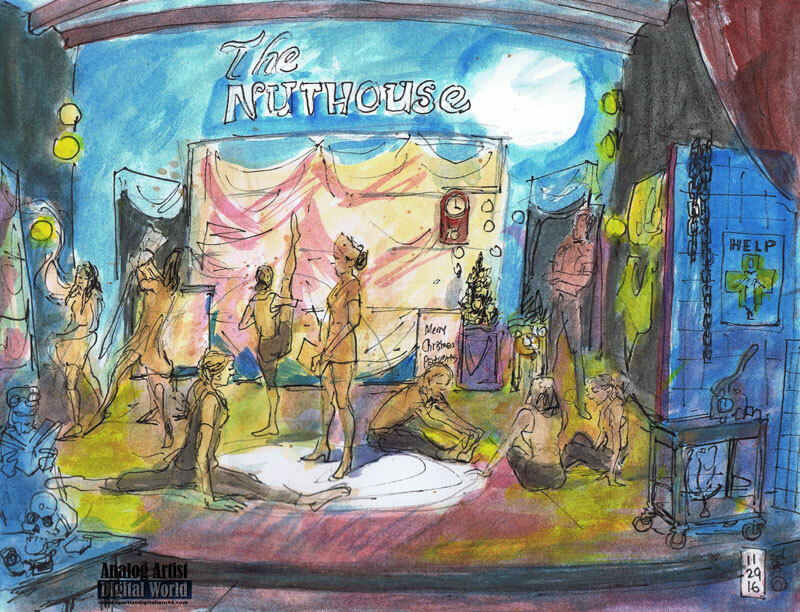 I went to a tech rehearsal at Marshall Ellis Theatre (1300 La Quinta Drive #3, Orlando, Florida 32809) for the world premiere of The Nuthouse. The ME Dance company has created a fun and inspired story with dance routines set to s music of the Nutcracker. The show promises to be a New Holiday Tradition for Orlando, Florida. Several years ago on Christmas Eve, Doctor Ebenezer, a caring and passionate inventor that dreams of revolutionizing the mental health industry at Nuremberg Asylum, was making a great discovery in supplemental medicines. The Doctor recognized that his patients served as prisoners in there own illnesses and so, in the hopes of cracking nuts, he began to perform lab experiments in order to create the perfect chemistry of drugs that would cure his patients. The Doctor continues to seek to provide a medical diagnosis of individuals by an assessment of their symptoms and signs associated with particular types of mental disorders. The Asylum is filled with various patients that suffer from anxiety, bipolar, insomnia, schizophrenia, attention deficit hyperactivity, and drug dependence disorders just to name a few. It is no easy task for the staff at Nuremberg Asylum to handle these challenges. However, it is Christmas Eve and the patients have been anticipating the annual Christmas festivities and the arrival of a new patient. Upon the arrival of Claire, the newest patient, Doctor Ebenezer assures her that she is safe for the general population and he releases her into the recreational room in the asylum. After the annual Christmas traditions have taken place it is back to the usual treatments of recovery. Claire, lost, scared and hopeless, finds herself in the Doctor's lab. She decides to take action to set herself free. While slipping off into a sleep state she thinks, "Is this the real life?' Locked in the asylum, she is different but still the same. The patients, nurses and Doctor continue to perform bizarre activities. The head nurse is suddenly dancing a hot romantic Flamenco with a male doctor. Young dancers from Marshal's dance class performed in the second act. They sat in front o me during the first act. This was their first opportunity to see the show from the audience. On stage a dancer was on the floor building a house of cards. When the house collapsed, she screamed. The young dancers reacted with surprise and delight. I loved watching a dancer that held a broom as her dance partner. Her dance was graceful and elegant as was her imagined partner. 4pm to 7pm. Free. Small Things Considered. Arts on Douglas. 123 Douglas St, New Smyrna Beach, FL 32168 Exhibit runs through January 10, 2016. Arts on Douglas is pleased to announce the opening of its premier year-end group exhibition and holiday sale, Small Things Considered. 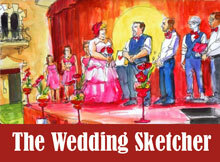 This annual exhibition features original small-scale works of art sized 10” x 10” or smaller. 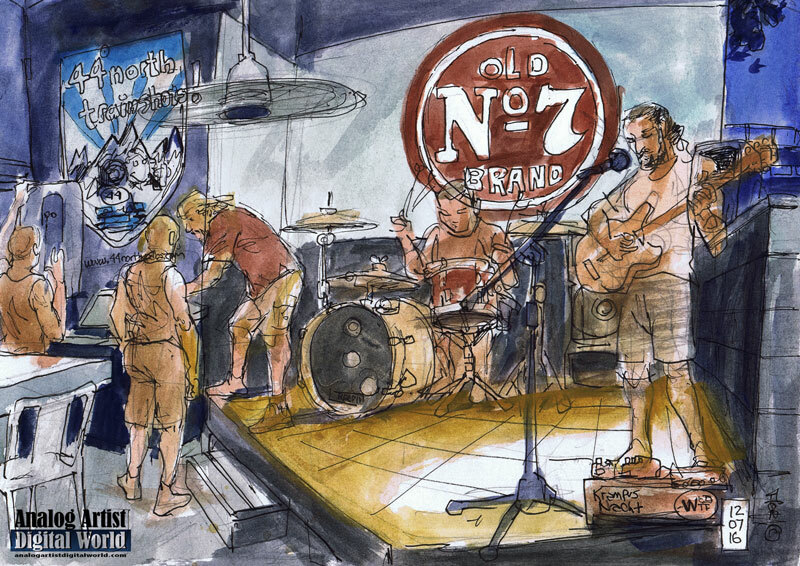 7pm to 9pm Second Ybor City Art Walk. 7th Ave Ybor Tampa, Florida 33605. Officially beginning the second Saturday of July (the 9th) we are bringing back the Ybor City Art Walk! Featuring a number of arts organizations and artsy businesses, be sure to R.S.V.P. here to get the official map for the walk! There will be other businesses joining the lineup so stay tuned! For any questions please feel free to contact the Ybor Art Alliance here through Facebook. 8pm to 10pm Shuffleboard at Orlando's Beardall Courts. Orlando's Beardall Courts 800 Delaney Ave Orlando FL. On the 1st Saturday of each month. Free fun! 10am to 6pm Free. Ciclovia. Downtown Orlando. Live music, food, Beer, Dancing, Yoga, walking, Biking, Skating. 10am to 4pm Free. Sparkle Art Market. Dandelion Communitea Cafe 618 N Thornton Ave, Orlando, Florida 32803. Sparkle is an annual Art Market made up of Central Florida's best artists, crafters, jewelers, designers, ceramicists and lots more. For one day, Sunday December 4th these makers, of all things beautiful, will gather for you to support local artists and keep your money in the community! The location is Dandelion Communitea Cafe, a healthy food venue where they prepare meals with love. The cafe is Certified Green by Co-op America and features rain barrels, a community herb garden and compostable to-go ware. 2pm to 6pm. Free. Light Up SoDo 2016. Sodo S Orange Ave at W Grant St, Orlando, Florida 32806. This is the BIGGEST Light Up SoDo event yet! We're taking over Sodo and lighting up Main Street for the holidays. This is a family-friendly event with a "naughty and nice" theme. Kick off the season with Santa, princesses, face painting, train rides, a beer garden, holiday market, live wreath making, DJ and more!